The launch of the Switch was an especially exciting one because, for the first time on a Nintendo system, a region-free eShop meant gamers everywhere had access to content from outside their home territory. North American gamers could grab VOEZ from the European or Japanese shops a week before its release in the region, everyone could Vroom! in the Night Sky right from the start (though we were unconvinced by that one), and there was even a quirky, colourful puzzle game — Soldam: Blooming Declaration — exclusive to the Japanese eShop that happened to have an English option. Some took the plunge, while others held out for a localisation; happily, brand new publisher Dispatch Games recently announced that it's taken up the challenge and is bringing the drop-down puzzler West, as Soldam: Drop, Connect, Erase. We were able to go hands-on with a very polished build at E3 this year, and after getting to try it out we’re so glad we did — what we played was fun, addictive, and delightfully different, a perfect compliment the Switch’s other heavy-hitter puzzlers. Soldam on Switch is actually based on a very deep cut from the Jaleco library: a 1992 arcade puzzle game starring characters from their earlier platformer Rod Land. After a single Game Boy port, the world hasn’t seen anything of Soldam since, so it’s more than ripe for revival. We tried out three main modes in our time with the game: Soldam, Challenge, and Showdown. The titular ‘Soldam’ mode was described to us as “the most Tetris-like” of the options, where play starts at speed level ‘0’ and proceeds all the way up through ‘200’, though our hosts stressed that playing Soldam as if it were Tetris would lead to game over screen very quickly. They were, of course, very right. 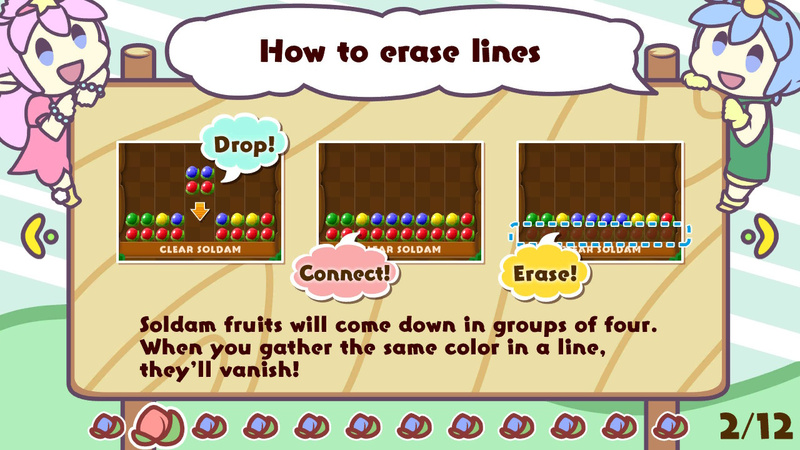 Soldam involves dropping quartets of coloured fruit, which can be rotated in both directions, onto the playing field below. The game starts out with only two fruit colours, but the variety increases up to four as you play. 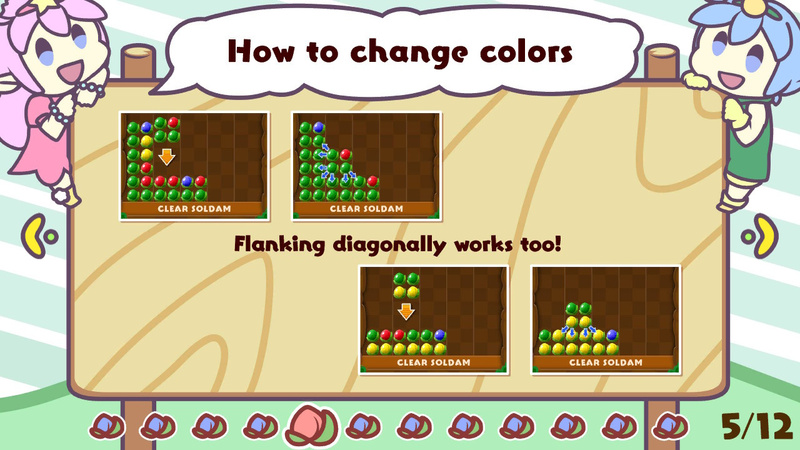 Rather than disappearing when they fill out a line — as in Tetris — or popping when next to like-coloured pieces — as in Puyo Puyo — however, Soldam’s fruits have their colour swapped when surrounded — either horizontally, vertically, or diagonally — by another colour. 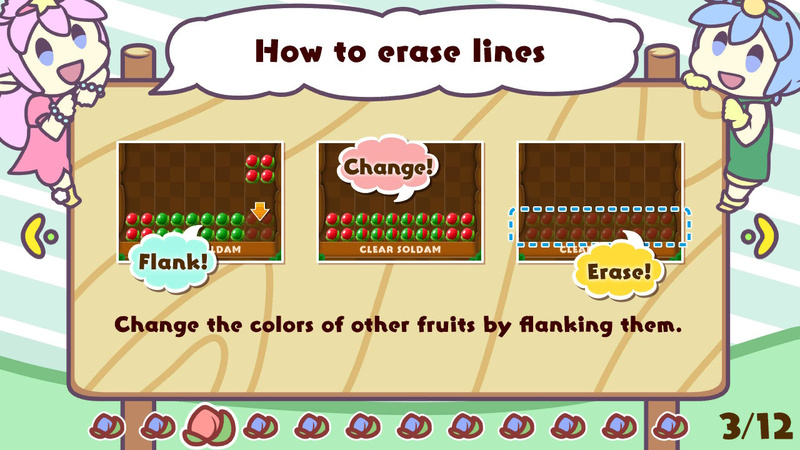 If you have a blue fruit on the lefthand side of the field, for instance, and a row of red ones heading out right from there, placing a blue fruit on the right side will cause the intervening reds to flip to blue. If you can get a whole row to turn the same colour, it will ‘jump’ to the bottom of the pile, and then act as an aid for making vertical and diagonal matches of that colour. Whichever colour you last cleared a row of, then, acts as a ‘base’ for long-distance swaps, so careful management of your bottom line is important. If that paragraph takes a second read to sink in, don’t despair — Soldam is one of the few puzzle games we’ve played that required some serious mental gymnastics just to get the hang of. That’s not a knock at all — we were hooked almost immediately and kept playing for far longer than our hosts had likely intended, and puzzle game vets will appreciate just how different it feels from the usual falling-block formulas. It also gives you a fair chance to get to grips with the basics; the Soldam mode starts out with groupings falling very slowly, with plenty of time to think and rethink moves before the fruit hits the fan. It’s all a bit hard to describe in prose, but we came away as huge fans of the format. 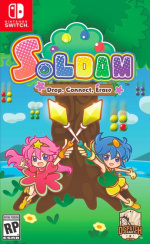 Soldam feels more immediately cerebral than similar block-drop games; while Tetris and Puyo Puyo can get insanely intricate in high level play, Soldam made us feel like puzzle game gurus right from the start, and its slower pace (at least initially!) lends itself to thoughtful, strategic play. For even more strategic thinking, there’s also the Challenge mode, Soldam’s answer to the ‘puzzle’ play in games like Puzzle League and Puyo Puyo. 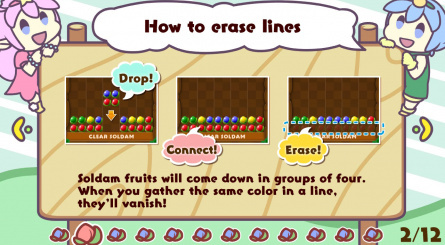 Here, you’ll need to accomplish specific goals — like erasing a certain number of lines at once or clearing a board in a set number of moves — with the helpful bonus that blocks don’t drop until you want them to. These levels tested our grasp of the fundamentals — which means we didn’t get very far! — and also feel like they would be great training for the auto-drop Soldam mode. After playing around with Challenge stages for a bit, our Dispatch demoers offered to take us on in Showdown, the game’s one-on-one battle mode. 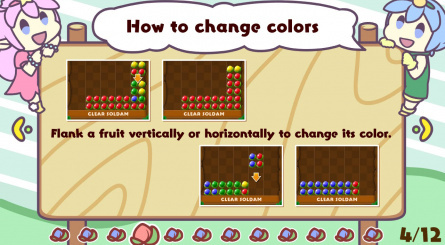 This was quite different again to either the Challenge or Soldam ruleset; here, each player is assigned a colour (manifested in the unchanging bottom and sides of the playing field) and tasked with clearing as many rows as possible to drive the opponent’s stack up to the top of the screen. The ‘up-next’ block in the middle is also up for grabs by both players at once, so there can be a real scramble for particularly useful pieces. Even though we didn’t win a single match of the five or so we played, it was a blast, and made for a nice change of pace from the single-player modes. One of the things our Dispatch representatives told us they were focusing on in this Western release of Soldam was adding in value over the original. To that end, they’ve gone in with a real boon of a bonus feature: online play. 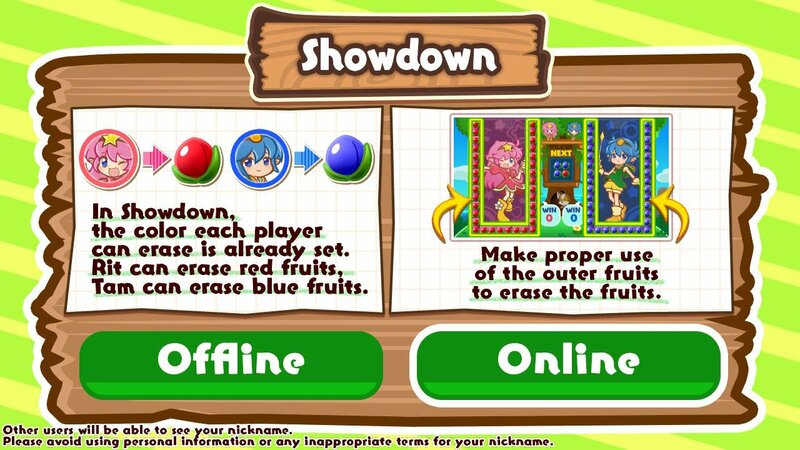 The Japanese version only supports local multiplayer, but in the North American and European releases you’ll be able to play Showdown mode online against friends and strangers, and that has us hugely excited. Dispatch also added in an all new localisation from scratch, and have adjusted a few UI elements — like optional arrows to show area and direction of effect — to make things clearer for new players. All that adds up to a real vote of confidence in the game, and after playing for as long as we could, we have to agree. 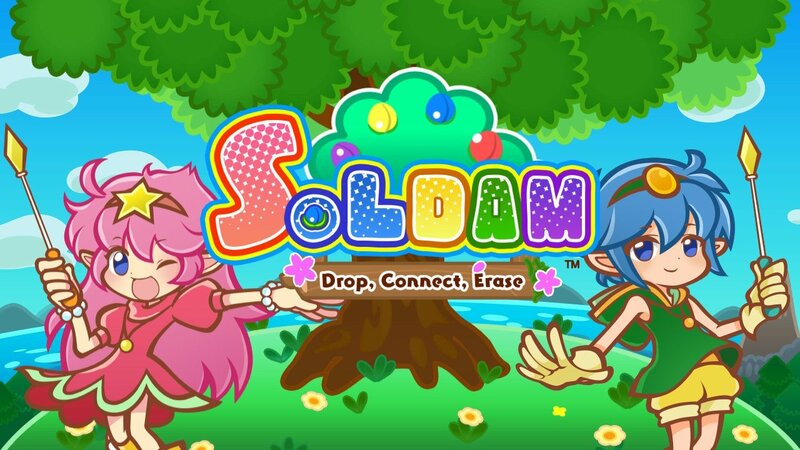 Soldam feels like a special game, and one we’re glad is getting a new lease on life on the Switch. Dispatch is aiming for a Fall 2017 release, in both digital and physical form, so puzzle fiends will have a new potential fix to look forward to before too long. 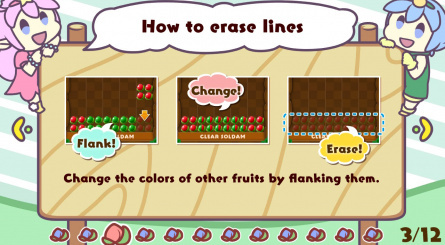 The story of a puzzle game that came out after Puyo Puyo Tetris on Switch was one of disinterest and economic failure. Perhaps future generations will find this game and ask the cosmos: why? This is something similar to ROD LAND ... two main chars in the picture seems like a copy of this old game. Isn't that puyo puyo tetris? @Uranux Well, Rod Land was a platformer, so I wouldn't say it's a similar game, but the characters and world are indeed from Rod Land. Oh that's great a Puzzle game! It seems the Switch isn't having a shortage of these. Let's hope it releases soon! I'd love a 'proper' Rod Land sequel. @Pazuzu666 Never gonna happen, the female one doesnt do games anymore. Will only the Western release have online play? ...Because if so, I would feel more ripped off for having bought the Japanese game than I already was. @ThanosReXXX You're Right ! I was just talking about the same aspect of chars Not the game which is clearly different from the rod land game. Do people read the articles anymore? Having said that, though: in general, I always wonder about people commenting and saying or asking stuff that is already explained in the article. Personally, I just can't imagine clicking on an article and then commenting basically on the title alone, instead of actually reading it. @joey302 Haha, all good. I couldn't resist teasing. It seems I can make out the four different colours, but not sure all colour blind people will. Adding symbols or different shapes could go a long way to help.